We invite all of my patients to view, research, and verify our surgeons credentials online. Please note that this section is not complete but we will do our best to request direct links from each of the organizations to verify online as quickly as possible. 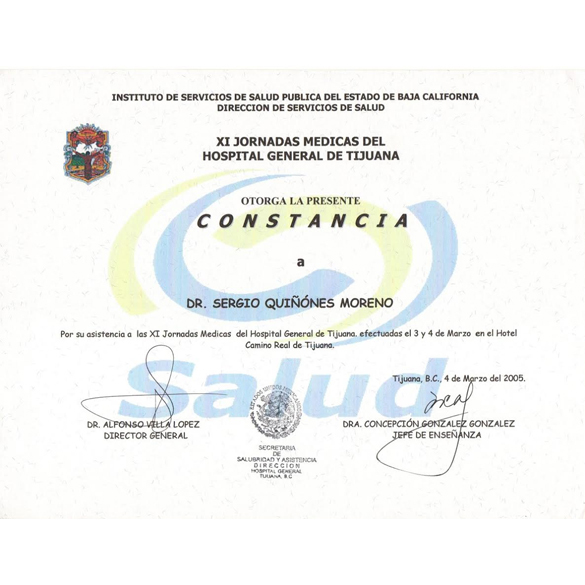 XI Medical Days Certificate For his attendance at the XI Medical Days of the General Hospital of Tijuana carried out at the Camino Real Hotel. 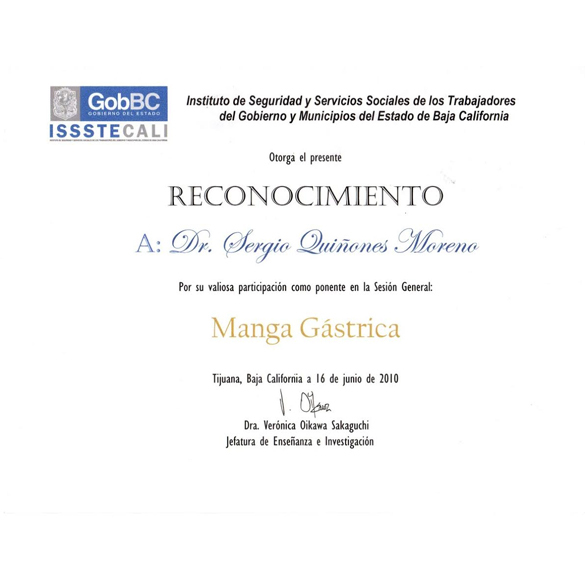 Gastric Sleeve General Session Award For his valuable participation as rapporteur in the General Session of Gastric Sleeve. 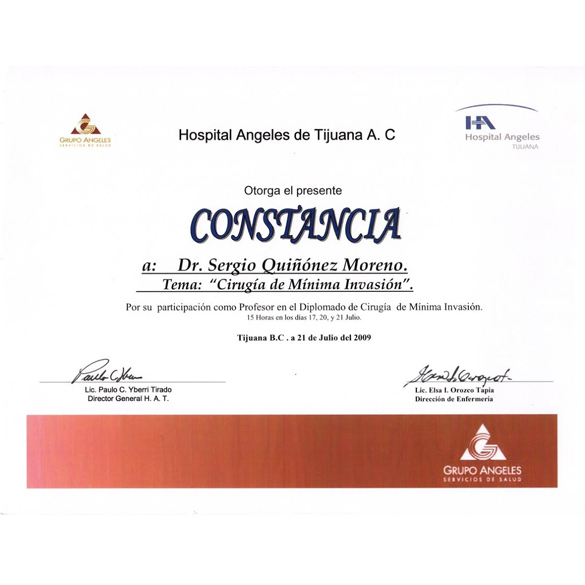 Minimal Invasion Surgery Certificate For his participation as professor in the Diploma of Minimal Invasive Surgery in Tijuana B.C. 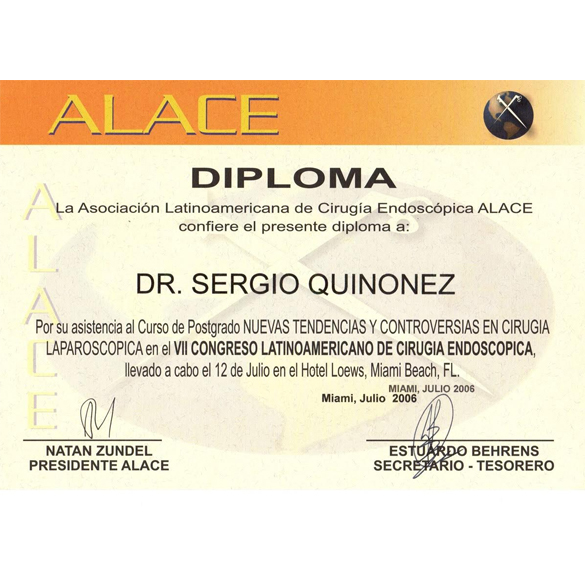 Contemporary Bariatric Surgery Diploma For his attendance at the Postgraduate Course of Contemporary Bariatric Surgery at the Latin American VII Congress of Endoscopic Surgery at the Loews Hotel in Miami Beach, Florida. 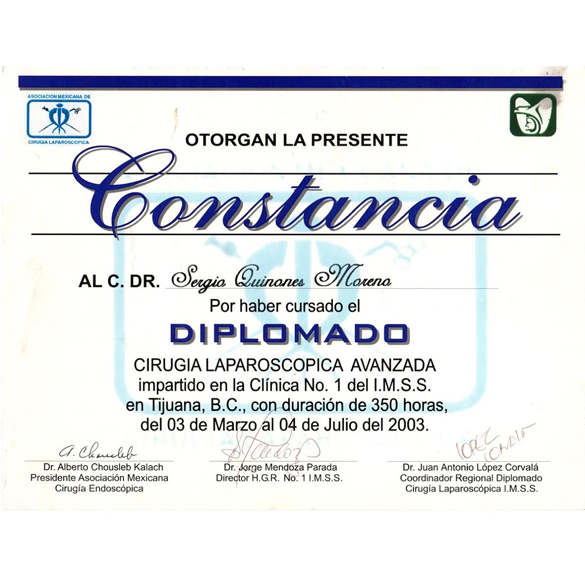 New Trends & Controversies in Laparoscopic Surgery Diploma For his attendance to the Postgraduate Course of New Tendencies & Controversies of Laparoscopic Surgery in the Latin American VII Congress of Laparoscopic Surgery. 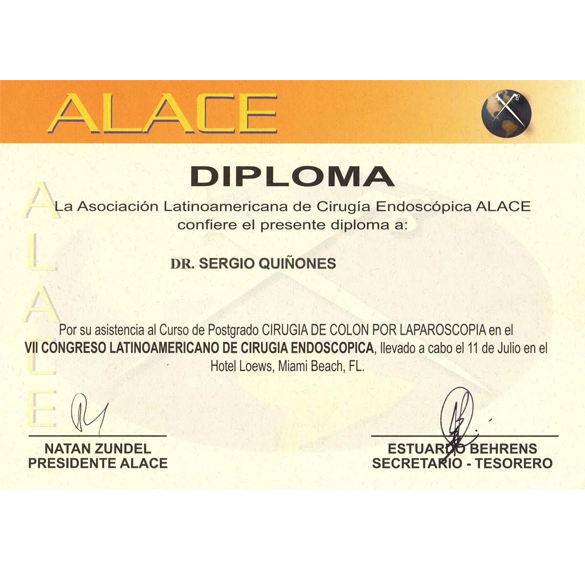 Laparoscopic Colonic Surgery Diploma For his attendance at the Postgraduate Course of Laparoscopic Colon Surgery at the Latin American VII Congress of Endoscopic Surgery at the Loews Hotel in Miami, Florida. 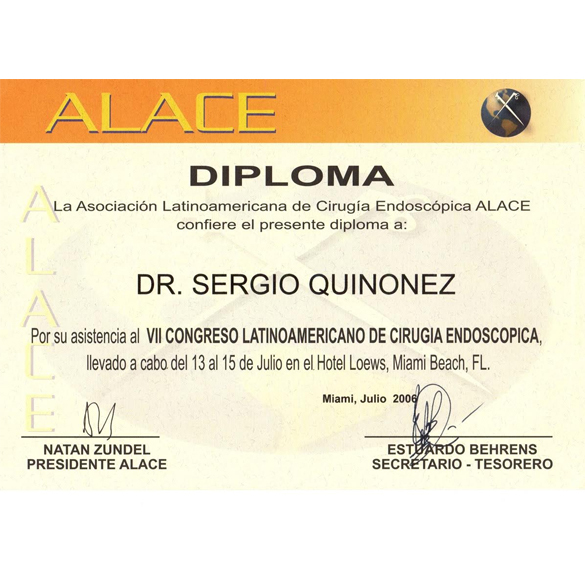 Latin American VII Congress of Endoscopic Surgery Diploma For his attendance at the Latin American VII Congress of Endoscopic Surgery at the Loews Hotel in the city of Miami, Florida carried out on July 13th to July 14th from 2006. 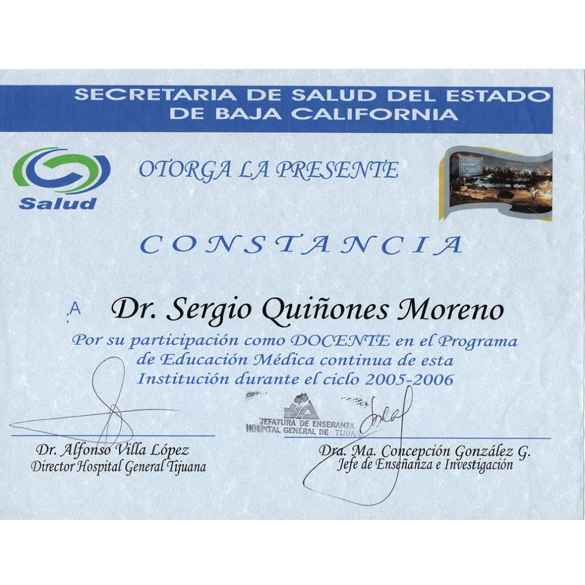 Continuing Medical Education Certificate For his participation as a Teacher in the program of Continuous Medical Education during the 2005-2006 cycle in Tijuana B.C. 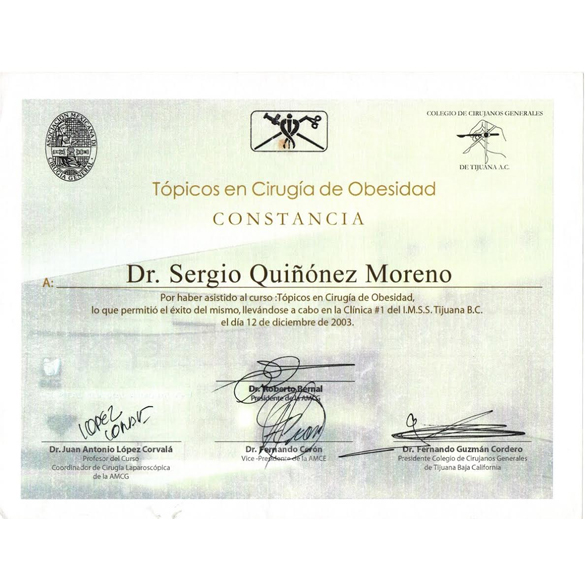 Topics in Obesity Surgery Certificate For having attended the course of Topics in Obesity Surgery, which allowed the course's success, being carried out in the clinic no 1 at IMSS, Tijuana B.C.